I may not be the biggest Kingdom Hearts fan out there. Despite some fun ideas, I find the games are bogged down by an utterly convoluted, incomprehensible plot, cliched original characters, and often monotonous gameplay. Not to mention the fact that all the spinoff titles released on a myriad of different platforms all serve as parts of the main story have made it impossible for anyone but the most diehard of fans to follow. But by God, Kingdom Hearts 3 has a Frozen level! Allow me to fanboy-out for a moment here. Frozen is my favorite Disney animated film, and yes, one of my favorite films, period. And yes, its presence in Kingdom Hearts 3 is enough to sell me on buying the game (again, the series isn’t horrible. If it were, I wouldn’t buy it even with the Frozen stuff). Now, this really shouldn’t come as any sort of surprise. 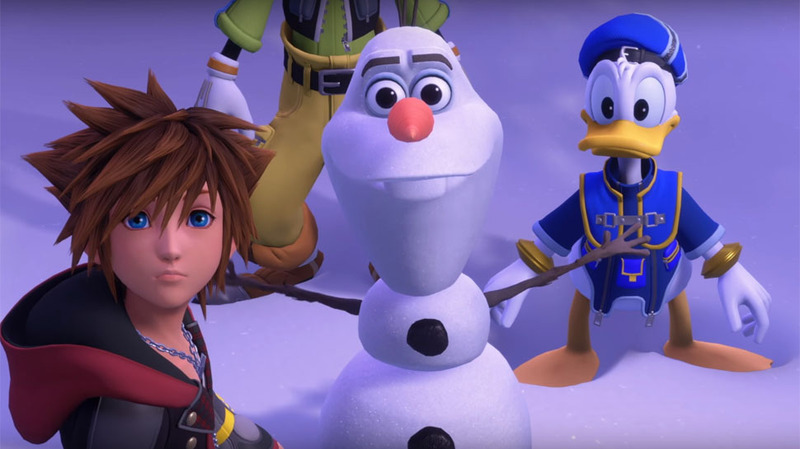 Seeing as Frozen is the biggest animated film in history – and is especially popular in Japan – it would be nothing short of dumbfounding to leave it out of a game filled with Disney franchises. But to actually see it in action is just…YES! On the downside, some of the dialogue in the reveal trailer suggests that this entry may still suffer from the narrative gobbledygook of the series. But heck, I’ll push through it for Anna and Elsa. Although I still have my skepticisms with Kingdom Hearts 3, I do admit I’m intrigued by the fact that it seems to be emphasizing modern Disney movies more than past entries of the series. Along with Frozen, Tangled, Wreck-It Ralph, Big Hero 6, and Pixar films like Toy Story and Monsters, Inc. have already been announced. I’ve made it no secret that I think Disney’s current run is their best ever (I don’t care what your nostalgia says). So while some older Disney films will be making a return (Hercules), I’m happy to see something as prominent as Kingdom Hearts is putting modern Disney in the spotlight. Yeah, I would probably prefer Kingdom Hearts if it were just the Disney (and Final Fantasy) characters. But whatever. We get Frozen. And they even nabbed Josh Gad to voice Olaf for the game, which is pretty great. Anyway, here’s the reveal trailer for the Frozen stuff in KH3, though be warned, some elements are clearly unfinished (pretty sure Elsa’s ice blast is supposed to have sound), which makes some parts a little awkward. Same goes for the fact that Haley Joel Osment is still the voice of Sora, despite the actor now being 30 and the character still a teenager (have we learned nothing from Goku’s ungodly Japanese voice?). …I promise I’ll add meaningful content soon. Previous Previous post: Responding to Blogging Awards + Wizard Dojo Fun Facts!